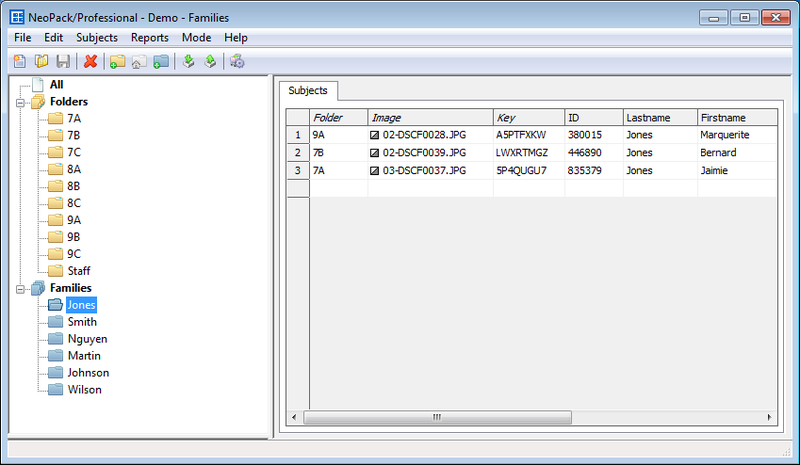 Version 4.2 introduced a new data entity in Details Mode - Families. With families, subjects from different home folders can be brought together into a 'family'. Images such as group photos can be matched to the family. Speciality products containing both the group image and individual subject images can be created for the family. When ordering online, all family images can be viewed together. The grouping of subjects into folders has long been an established practise in Details Mode. In school photography subjects are normally grouped into folders per class, teacher or grade. In sports photography subjects are often grouped into folders per team or coach. A family in the traditional sense of the word - grouping siblings! Why use families instead of just creating extra folders? Consider the following typical scenario in school photography. Typically photographers handle this situation by creating a new subject, "Smith family" for example, and matching the sibling photographs to this subject.